Eating strict paleo for approx 30 days, test your performance and body composition changes. Buy In $25.00 Two Winners. They will split the pot. 30 day commitment to eating strict Paleo. See how you look, feel and perform. You should see more efficient workouts, improved sleep, reduced allergies, burn more stored fat, have more energy through out the day. You may notice a decrease in swelling in your legs or other areas, decrease in inflammation and decreased waist size. It’s simple: Eat clean for 30 days. You will be 100% in charge of your results. Tips on how to be successful. Partner up with a friend that is also eating paleo for tips and encouragement. Post and comment in our CFSWP food blog and check in with your community and trainers on what is and isn’t working. We are here for you. What To Eat: Lean meats, seafood, vegetables, fruits, nuts, seeds and healthy fats. We recommend reading, ‘The Paleo Diet’ by Robb Wolf and his ebook,’30 days Total Transformation’ for shopping lists and a 30 day meal planner. Avoid Eating Dairy, grains, processed foods and sugars, legumes, starches and alcohol. Before photos due by Jan 4th. and by Feb 1st. Winners are asked to share them but do not have to post them to public. These pictures are mostly for your personal reference, you do not have to share these with the community unless of course you win. 😉 Take the pictures in shorts and a tank top or bathing suit. You will need front, side, back and profile shot of your face close up. Measurements: Waist just under belly button. Before and after Challenge. Performance: Your score on Benchmark workout before and after. Optional: We always see outstanding changes here. Do it for yourself. Blood work: If you can do this for yourself. Do it. read chapter 11 in the Paleo Solution to get details on why these markers are important. Scale: We will take weight measurements but remember as you exercise muscle and fat are changing and it is really based on how you fit in your clothes and look not what the scale tells you. We start January 1st but have our testing baseline/ benchmark workout Sunday, Feb 4th at 3:00pm. Pictures and measurements at 2:30. We end and retest on Sunday, February 1st at 3:00pm. The winners are the athletes with the best performance and body comp improvements. To win we need your measurements/pictures and benchmark scores, both before and after. Recommend reading: http://robbwolf.com/ http://thepaleodiet.com/ The Paleo Diet and 30 days total Transformation ebook by Robb Wolf. Paleo recipes: http://nomnompaleo.com/ http://beta.primal-palate.com/ http://nomnompaleo.com/ Benchmark WOD A. You will have 10 minutes to find a heavy single Clean. Score: The weight you cleaned. From Robb Wolf’s 30 day Total Transformation: What is the Paleo diet? The Paleo diet, put simply, is a way of eating that mimics what our Paleolithic ancestors ate (a hunter/gatherer lifestyle). It is a simple, yet remarkably effective approach for fat loss as well as preventing or reversing a number of degenerative diseases. The Paleo diet is built from the healthiest, most nutritious foods available: • Lean proteins (such as grass-fed meats, free-range fowl, and wildcaught fish) that support strong muscles, healthy bones and optimal immune function. Protein also makes you feel satisfied between meals. • Fruits and vegetables (seasonally harvested, locally grown) rich in antioxidants, vitamins, minerals and phytonutrients that have been shown to decrease the likelihood of developing a number of degenerative diseases including cancer, diabetes and neurological decline. • Healthy fats (such as nuts, seeds, avocados, olive oil, fish oil and grass-fed meat). Scientific research and epidemiological studies show that diets rich in Monounsaturated and Omega-3 fats dramatically reduce the instances of obesity, cancer, diabetes, heart disease and cognitive decline. Why does it work? The Paleo diet is the healthiest way you can eat because it is the ONLY nutritional approach that works with your genetics to help you stay lean, strong and energetic! Research in biology, biochemistry, Ophthalmology, Dermatology and many other disciplines indicate it is our modern diet, full of refined foods, trans fats and sugar, that is at the root of degenerative diseases such as obesity, cancer, diabetes, heart disease, Parkinson’s, Alzheimer’s, depression and infertility. Our Paleolithic ancestors were largely free of these diseases, and you can be too! When we eat according to our genetic heritage, weight loss, improved energy, and optimal health are fun and easy to accomplish. Nutrition At its core, the Paleo diet is an anti-inflammatory diet. Processed foods, trans fats, high carbohydrate intake and a skewing of our ancestral omega-3/omega-6 fat ratio cause systemic How to eat Although the Paleo Solution starts with healthy and delicious foods, not everyone’s needs and situations are the same. 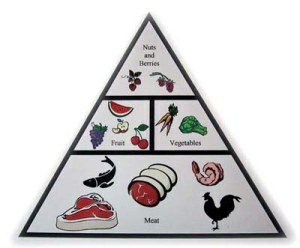 The Paleo diet is infinitely customizable to meet YOUR specific needs and goals. Diets that recommend rigid food ratios or Spartan calorie counting seldom work over the long term because these approaches typically emphasize foods (refined grains, sugar and dairy) that are at odds with our genetics. If your goal is to lose fat using the Paleo Solution, the majority of your meals should look something like this: • 4-8 oz of lean protein such as chicken, lean beef, turkey, pork loin or seafood • Several servings of multicolored vegetables, either raw, steamed or lightly cooked • Round out the meal with good fats from avocado, olive oil or a handful of unsalted nuts such as almonds, pecans, macadamias or walnuts • Eat this way 3-4 times each day. PLAN PLAN PLAN ahead for the week! Protein, protein, protein We recommend eating 1 gram of protein per pound of bodyweight. That means if you’re a gal who weighs 160 pounds, you should be eating 160 grams of protein per day. Let’s start adding that up. • 4 oz. chicken = 27 grams • 4 oz. salmon patty = 30 grams • 5 oz. turkey burger = 35 gramsThat’s 92 grams so far. 68 more grams to go! Keep eating that protein! Why so much protein? Remember the neuro-regulation of appetite Robb talked about in the audio file? Protein helps with that. It’s also an extremely satiating food, which means that you’re never going to be hungry on the Paleo diet. What about fat? Contrary to popular belief, fat will not make you fat. Eating fat, even saturated fat found in healthy foods like coconut oil, is fine. However, if you have a significant amount of weight to lose, we recommend not adding a ton of fat to your meals. Add some fat for flavor, some nuts with your berries as a dessert, cook in healthy coconut oil or put olive oil on your salad to dress it up, but don’t go crazy on the fat until you’ve leaned out to your desired level. HOW to shop? Read more in Robb’s ebook, ‘30 Day total Transformation’! 12-21 Happy Holidays! Dec/Jan Specials!